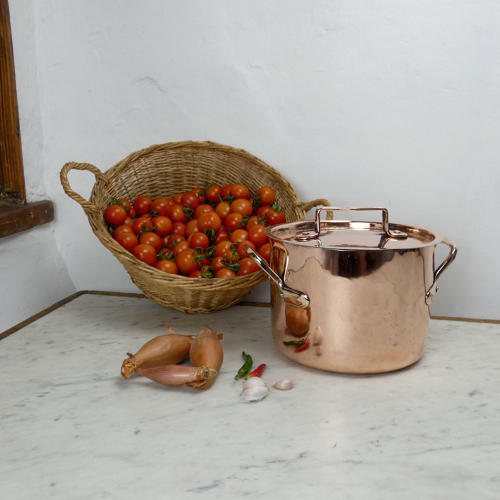 A French copper, shallow stock pot, or casserole,and cover. This is quite an early piece, dating from c.1860. There are no manufacturers marks and the pot could be country made. It is made, from a heavy gauge of copper but it is slightly primitive in style. It has squared form, brass handles to the sides and a nicely shaped, copper start handle to the lid. It is in excellent condition and the interior has been re-tinned, in the traditional manner, so that it can be used. This would be an attractive piece for taking from the stove straight to the table with a soup or casserole.